FABULOUS 2014 New Kitchen. Includes Cabinets, Granite tops, LG Brand SS appliances, porcelain tiled flooring, tiled back splash, breakfast bar & a breakfast room. Classic Living Room, new stone tiled fireplace surround. Hardwood floors. Dining Room with Sliders to Deck/Outdoors. Master Bedroom with separate sitting area, peaceful views. Master Bath, separate Tub and Shower, Dressing area. Lovely second Bedroom with Full bath. You will love finished Lower level, Freshly painted, New Carpeting, 3 rooms, Family Rm, Office, and Laundry/Utility room. New 2014 LG brand Washer/Dryer. One car garage, new 2014 opener. 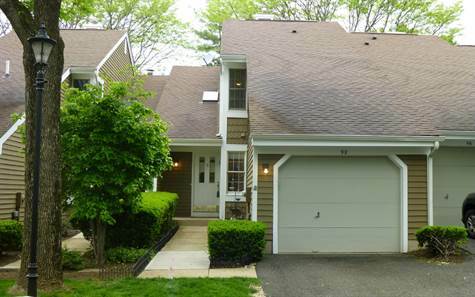 Lovely Townhome in Much Desired Stone Run section of The Hills. Easy access to Shopping Malls, Restaurants, transportation routes.Clubhouse w/Exercise Room, walking/jog paths, Tennis Courts & Pool.